1. INTRODUCTION The age of the Internet of Things (IoT) is forthcoming . It will give objects and even generated contents to the ability to communicate with other mediums. With the generated data from every object, the data will not remain raw as they are today but will be customized to the users based on their needs and even converge with other data. The concept of IoT is simple, although its capability is unlimited and its usage can change the entire paradigm of legacy technology. It is based on embedding a network interface into objects, enabling communications among them to provide various services for users. Consequently, each object will have its own identifier, such as an Internet Protocol address (IP address) in the current Internet that can connect and communicate with other objects through the IoT networking environment. Unlike the era before IoT, when the users could obtain data only from the service provider, the users can directly access the sensors and give commands to the actuators. With this capability, data from IoT applications will be utilized to provide a novel service to industry, academia, and even personal use. 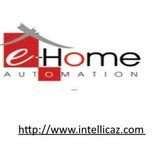 Internet of Things can be defined as the collection of two terms: one is Internet, which is defined as networks of networks which can connect billions of users with some standard internet protocols . Internet connects several different sectors and department while using different technologies. Several devices like mobile, personal systems and business organizations are connected to Internet. The second term is Thing; this term is basically mean to these devices or objects which turn into intelligent objects . Moreover this it is also a part of all objects of this real world. If we want to define IOT then we cannot define it precisely and concisely but Vermesan et al. defined the Internet of Things as simply an interaction between the physical and digital worlds. The digital world interacts with the physical world using a plethora of sensors and actuators . Copyright ÂŠ 2018 by the Authors. This is an open access article distributed under the Creative Commons Attribution License, which permits unrestricted use, distribution, and reproduction in any medium, provided the original work is properly cited. layer, and device layer. Many research institutions adopt the IoT classification standard shown in Figure 1 to maintain specialty and consistency for IoT development. The service layer, which is on the surface, provides the interface and communicates with the users. Examples of the service layer are autonomous driving, health care, smart industry, personal devices, and door security. These services are connected with a platform layer to provide customized services to the users. The next layer of the IoT structure is the platform layer. The platform layer is located under the service layer and supports the IoT applications and services. There are many types of platforms, including the device platform, data analysis platform, service development platform, and service platform. For instance, the device platform provides an execution environment of services and development for users. Context awareness and prediction, cooperation among things, and connection between the service layer and other layers with the translation of natural language to machine language are examples of the data analysis platform. Furthermore, the service development platform provides development toolkits to users for them to easily develop IoT services. Finally, the service platform supports the generation and execution of a variety of applications. Along with the service and platform layers, one of the core layers of the IoT environment is the network layer. It serves to transmit the data among devices, contents, services and users. The network layer should be able to process, control, and manage enormous amounts of network traffic. A detailed elaboration of the network layer will be further described later in this paper. Finally, the device layer is a layer that perceives the environment with various sensing devices, processes it to send to the sink node or gateway, and responds to it if necessary. The device itself must be smart by applying autonomic actuation and a smart control algorithm. The device layer should be able to acquire and control the IoT devices. In addition to the four layers, security and privacy are important in IoT. Instead of identifying security as its own layer, each layer should incorporate a security solution to protect it from threats. Security issues should be handled as an important functional entity for each layer, and their current or prospective solutions should be customized according to specific properties and operations of each layer. Each layer is important and has its own roles and capability to enable IoT. Although each layer of IoT is important and should be discussed in depth, the aim of this paper is to describe the IoT network in detail. We will primarily focus on the IoT network in terms of its challenges and provide insights for the future IoT network. 3. APPLICATION OF IOT Medical care or health care is one of the major challenges of this world, it is estimated that approx 20-30 billion  population of this world suffer from different disease such as arthritis, asthma, cancer, COPD, diabetes , care for elderly people such as Heart Attack  detection, Activity and Movement Recognition of elderly people and many more. The past few years have witnessed that Internet of Things (IoT)  has evolved a lot and continues to evolve in Medical care or health care is one of the major challenges of this world, it is estimated that approx 20-30 billion  population of this world suffer from different disease such as arthritis, asthma, cancer, COPD, diabetes , care for elderly people such as Heart Attack  detection, Activity and Movement Recognition of elderly people and many more. The past few years have witnessed that Internet of Things (IoT)  has evolved a lot and continues to evolve in As the internet of things is a new idea for physical objects or things, called “smart devices” and is a very challenging area in the field of information technology and computer science. For scholars, the main challenges while deploying internet of things are to prepare and process data for classification because of an unprecedented increase in the amount and complexity of data collected by different types of sensors. The IOT permit the smart health objects for remotely managing and sensing the data of the smart health devices across the network infrastructure this will reduce human intervention and also Copyright © 2018 by the Authors. This is an open access article distributed under the Creative Commons Attribution License, which permits unrestricted use, distribution, and reproduction in any medium, provided the original work is properly cited. increase efficiency, productivity, accuracy and economic benefit of the devices and also helps the patients in accessing the health services from a remote location. 4. TECHNOLOGY USED in IOT 4.1 Radio Frequency Identification (RFID): RFID is a system in which there is a reader to read many tags. It uses the technology of radio waves to send the information of an object in the form of serial number which is attached to the tag. It uses the electromagnetic fields to transfer the data on the tags so that it can automatically identify and track the objects, corresponding to a particular tag. As we already mention that RFID technology is based on reader and tags, so in the initial phase of research RFID defines in threeconfigurations: Active RFID  Passive RFID  Active Reader Active Tag Active RFID - (Passive Reader Active Tag), the reader receives the signal or information from the device which runs on battery and this battery is operated by a device called active tag. This information exchange will take place in limited range of the active tags and the passive readers which is from 1-2000 feet depending upon the architecture . Passive RFID - The second one is Passive RFID (Active Reader Passive Tag), most commonly used, such tag does not have any battery or onboard power supplies, so it requires energy to send the data and thus harvests the energy from the RFID reader. Active Reader Active Tag - The last one both the reader and tags are active so it is an Active Reader Active Tag. Although both the reader and the tags are active, but tags will start sending information only when it is awoken by the reader or when it comes in the proximity of the reader. So by this we can say that the main components of this technology are tag, reader, power supply, antenna, access controller, software and server. 4.2 Near Field Communication (NFC): Near Field Communication is somehow little bit similar to RFID, it combines a RFID reader in a mobile phone, which makes it better, reliable and efficient for the users. Near Field Communication is a short-range wireless technology with the frequency of 13.56 MHz, typically work for very small distance up to 4 cm. Allows intuitive initialization of wireless networks and NFC is complementary to Bluetooth and 802.11 with their long distance capabilities at a distance circa up to 10 cm. It is first developed by Philips and Sony companies. Data exchange was approximately 424 kbps. Power consumption during data reading in NFC is under 15ma. There are two modes in NFC technology:  Active  Passive Active Mode - In active mode both the devices are active and communicate with each other by sending the signals. Passive Mode - In passive mode one of the device sends the signal rather other just receiving it.NFC doesn’t need pairing, it cannot work from a long distance and in this way this technology is secure and use for mobile payments. 4.3 Machine to Machine Communication (M2M) Machine-to-Machine (M2M) refers to the communications between computers, embeddedprocessors, smart sensors, actuators and mobile devices (DYE, 2008). The use of M2M communication is increasing in the scenario at a fast pace. For instance,researchers predicted that, by 2014, there will be 1.5 billion wirelessly connected devices excluding mobile phones. Now a days, there are approx 2 billion wirelessly connected devices which can gather information from the sensors, analyse this data and send the information to other devices to perform some task. Copyright © 2018 by the Authors. This is an open access article distributed under the Creative Commons Attribution License, which permits unrestricted use, distribution, and reproduction in any medium, provided the original work is properly cited. Machine receives the information and perform the operation with the help of actuators, sensors, embedded processors and application software.. 4.4 Vehicle to Vehicle Communication (V2V) In this technology the objects are vehicles, which can communicate with another vehicle or the sensors around them. The main aspect of concern here is, there is no proper method to define the protocols because the object is moving and communicating with another moving object or with the sensors on the roadside . So we are not able to define any routing protocol. This communication can work for a long distance and make an efficient communication among objects. This technology was designed primarily with the aims of traffic control, safety and accident avoidance. 5. CONCLUSION Current IoT research has been classified in terms of layers of service, platform, network, and device. In this paper, we focused on the network layer, which we believe is the most important part of realizing the IoT environment. We surveyed the IoT network and presented insights about the future IoT network. The success of IoT will be based on the novel architecture of the IoT network. Without well-designed network architecture for the IoT, IoT services and devices will not seamlessly operate and provide necessary services to the users. To give insight to researchers, we introduced a novel architecture for the IoT network and some techniques that are predictable or certain in such as architecture, such as IoT network management, connection management, grouping and privacy. REFERENCES 1. Yan, Z.; Niemi, V.; Yang, L.T. Key technologies for 5G, the next generation of mobile networks and services. Int. J. Commun. Syst. 2016, 29, 2328–2329. Shashank Agrawal, Dario Vieira, “A survey on Internet of Things,” Abakós, Belo Horizonte,v. 1, n.2, p. 78 – 95, maio 2013 – ISSN:2316–9451. Jayapandian N., Rahman A.M.J.M.Z., Radhikadevi S., Koushikaa M., (2016), “Enhanced cloud security framework to confirm data security on asymmetric and symmetric key encryption”, 2016 World Conference on Futuristic Trends in Research and Innovation for Social Welfare (Startup Conclave), pp. 1-4. Zubair Rahman A.M.J. Jayapandian N., (2017), “Secure and efficient online data storage and sharing over cloud environment using probabilistic with homomorphic encryption”, Cluster Computing, vol. 20, no. 2, pp. 1561-1573. M Anoopkumar, AMJ Md Zubair Rahman, (2016), “A Review on Data Mining techniques and factors used in Educational Data Mining to predict student amelioration” 2016 International Conference on Data Mining and Advanced Computing (SAPIENCE), pp. 122-133. N Jayapandian, AMJ Md Zubair Rahman, M Koushikaa, S Radhikadevi, (2016), “A novel approach to enhance multi level security system using encryption with fingerprint in cloud”, Futuristic Trends in Research and Innovation for Social Welfare (Startup Conclave), World Conference on IEEE, pp. 1-5. 10. M. Anoopkumar, A. M. J. Md. Zubair Rahman, (2015), “A comprehensive survey on educational data mining and use of data mining techniques for improving teaching and predicting student Copyright © 2018 by the Authors. This is an open access article distributed under the Creative Commons Attribution License, which permits unrestricted use, distribution, and reproduction in any medium, provided the original work is properly cited. performance”, Advances in Innovative Engineering and Technologies, ISBN: 978-0-9948937-1-0, pp. 55 – 84. 11. Panneerselvam N., Murugesan A., Porkodi K.P., Jima T., Vijayakumar C., Subramaniam D., (2016), “Computational engine performance and emission analysis using Ceiba pentandra biodiesel”, Biofuels, vol. 7, no. 3, pp. 201-206. 12. Mathew O.C., Rahman A.M.J.Z. (2016), “A novel energy optimization mechanism for medical data transmission using honeycomb routing”, Journal of Medical Imaging and Health Informatics, ISSN: 2156-7018, vol. 6, no. 3, pp. 857-862. 13. Miao W., Ting L., Fei L., ling S., Hui D., 2010. Research on the architecture of Internet of things. IEEE International Conference on Advanced Computer Theory and Engineering (ICACTE), Sichuan province, China, Pages: 484-487. 14. 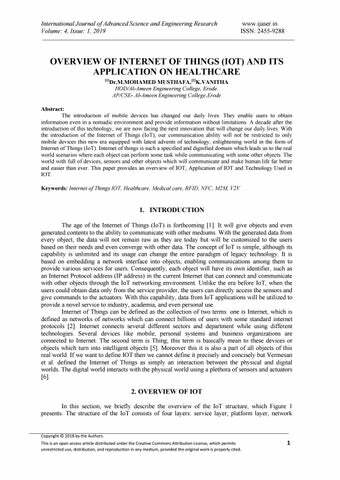 S. M. R. Islam, D. Kwak, M. H. Kabir, M. Hossain and K. S. Kwak, "The Internet of Things for Health Care: A Comprehensive Survey," in IEEE Access, vol. 3, pp. 678-708, 2015. 15. K. Chui, W. Alhalabi, S. Pang, P. Pablos, R. Liu, and M. Zhao, “Disease Diagnosis in Smart Healthcare: Innovation, Technologies and Applications,” Sustainability, vol. 9, no. 12, p. 2309, Dec. 2017. 16. Gowrishankar S., Prachita M Y. and Arvind Prakash, “IoT based Heart Attack Detection, Heart Rate and Temperature Monitor”. International Journal of Computer Applications (IJCA) 170(5):26-30, July 2017 17. I. Bisio, A. Delfino, F. Lavagetto and A. Sciarrone, "Enabling IoT for In-Home Rehabilitation: Accelerometer Signals Classification Methods for Activity and Movement Recognition," in IEEE Internet of Things Journal, vol. 4, no. 1, pp. 135-146, Feb. 2017. 18. Marimuthu Palaniswami, Rajkumar Buyya, Jayavardhana Guddi, Slaven, Marusic, “Internet of Things (IOT): A Vision, Architectural Elements, And Future Directions,” Elsevier, Future Generation Computer Systems, vol.29, pp. 1645-1660, Feb. 2013. 19. H. C. Chen, M. A. A. Faruque and P. H. Chou, "Security and privacy challenges in IoT-based machine-to-machine collaborative scenarios," 2016 International Conference on Hardware/Software Codesign and System Synthesis (CODES+ISSS), Pittsburgh, PA, 2016, pp. 1-2. 20. Y.Usha Devi, Dr. M.S.S.Rukmini, “IoT in Connected Vehicles: Challenges andIssues- A Review,” International conference on Signal Processing, Communication, Power and Embedded System (SCOPES)-2016. Copyright © 2018 by the Authors. This is an open access article distributed under the Creative Commons Attribution License, which permits unrestricted use, distribution, and reproduction in any medium, provided the original work is properly cited.